to seek His face and His will for our nation. 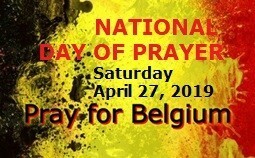 We will stand shoulder to shoulder in the gap for Belgium and experience the power of unity in prayer! Our goal is nothing less than breakthrough and revival, a shift in the spiritual atmosphere over the nation. This day is open to all Christians. We focus on the whole of Belgium and will do it in three languages (EN, FR & Dutch).